Check out our Deluxe Wedding Weekend Package below! Looking for a unique venue for your next event, look no further. We can host up to 200 people in our newly renovated Country 3 Season Barn. The large Barn is a fantastic open and airy space, perfect for large functions, weddings, concerts and events. There is a convenient bar area made of pine and a handy prep kitchen. We also have a number of other outside spaces here on the Farm, suitable for ceremonies and other gatherings. Choose to get married under the Big Tree, a very symbolic representation of the many years your love will grow as it takes root and branches out with new family members. Have a relaxed, Sunday celebration on the patio. Take your event outside under the tent. The choice is yours! 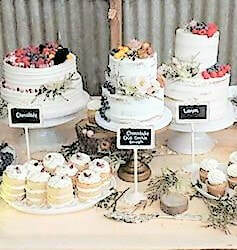 We are a complete farm to table venue providing your special day with products so close to our heart. Contact us to see how we can help make your dream wedding a reality! - Two nights stay in our newly renovated farmhouse B & B for up to 12 overnight quests with a lovely continental breakfast (homemade bread, fresh jam, yogurt, homemade granola, fresh fruit, and homemade quiche). - The beautifully restored barn for seating up to 150 dinner guests or 200 people for your reception. The barn is fully equipped with harvest tables, an eclectic mix of wooden chairs, a bar area, complete place settings in antique china (dinner plates, side plates, utensils, cloth napkin & both water & wine glasses), wall decor, lighting, and convenient restrooms. - Our peaceful meadow with row seating, a signing table, and seasonal decor. Also, the courtyard with a festive fire pit for outdoor enjoyment. - An outdoor kids area and a variety of photo op gardens throughout the grounds. Package Price $3,500 plus tax. * Additional nights stay & catering options extra. Tell us some more about your event. What's the occasion? How many people? What time of day? Do you have ideas about the menu? Customize your special day, your way! You can meet with our Chef and discuss menu options and we can cater to all your meals under one roof. 1. BBQ Pkg - A great outdoor option. 2. Picnic Party Pkg - Indoor or under a tent. Planning your wedding at another location and want to have a night of dancing and socializing we can help you with that! Let us help you with the stress and mess and you sit back and enjoy the evening! Would you like to book the grounds for a few hours to take advantage of our beautiful setting? Call us and we can help you with that too! Seasonal Floral Arrangements made for your tables. Keep your guests safe and ask about the cost of the convenient shuttle service. Book extra night stays for you and 12 guests at the farm house or for just the two of you.